Laramide is a Canadian-based company with diversified uranium assets strategically positioned in the United States and Australia to deliver uranium to an increasingly energy dependent world. Laramide owns large development stage uranium projects in the United States and Australia. Investor Presentation, Financials and Share information for prospective and existing Laramide shareholders. A proven management team with strong and successful depth of expertise in uranium mine development and operations. Laramide’s U.S. and Australian uranium projects provide potential for low cost, low technical risk mine production. Laramide’s U.S. in-situ recovery project is 51 million pounds Inferred Resource with potential for near-term production. Church Rock, Crownpoint and nearby assets form a leading ISR division operating in New Mexico. Laramide La Sal’s conventional hard-rock uranium mining project is permitted for a bulk sample program in Lisbon Valley Uranium District in Utah. At La Jara Mesa Project, a sandstone-hosted roll front style deposit in New Mexico, permitting is nearly complete. Laramide’s flagship Australian resource is an advanced stage uranium deposit located in NW Queensland, with total resource of 51.9 million pounds of U3O8. Nuclear power is more than 99%+ free of smog and greenhouse gas emissions. or 30% increase in electricity from nuclear power by 2030.
of electricity across the United States is clean nuclear energy. Consumers benefit from reliable and affordable nuclear energy. 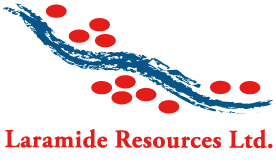 All our latest news, corporate updates, announcements, uranium industry coverage and press releases from Laramide Resources Ltd. The best way to stay up to date is to sign up for our newsletter. Laramide Resources Ltd.’s President and CEO Marc Henderson provides a CEO newsletter on Laramide’s projects and the economic climate for nuclear energy. By providing your email address you are consenting to receive press releases, corporate updates and other information from Laramide Resources Ltd. We will never sell or share this information to anyone.